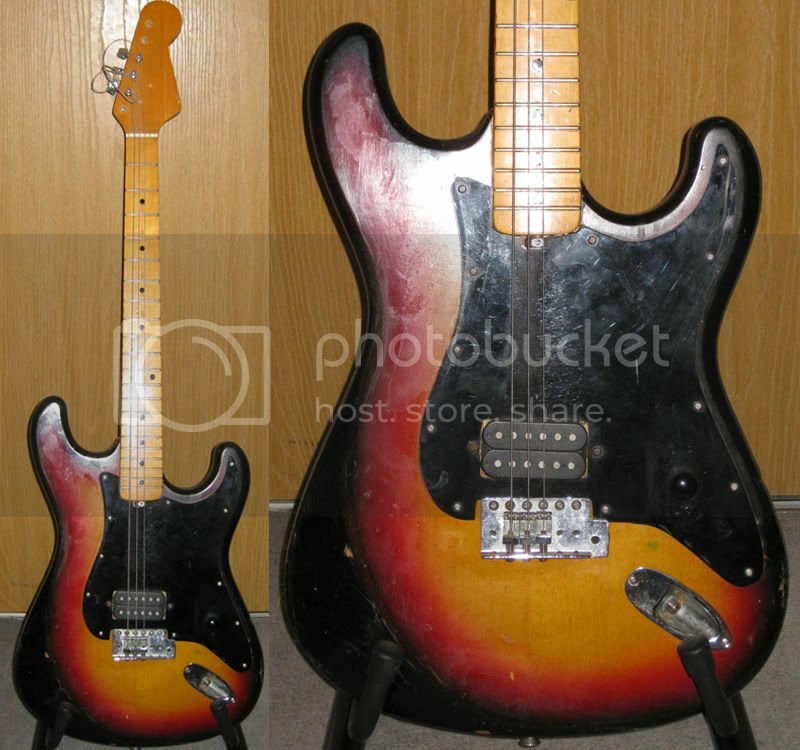 Fender have never made a production model doubleneck guitar (yes, there have been Custom Shop doublenecks), but that never stopped some of the Japanese manufacturers from the 1970s from having a go at combining two Fender designs into one. 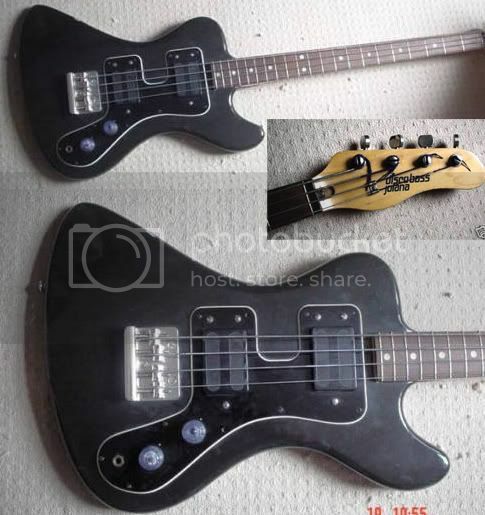 Here we see an Ibanez Jazz Bass/Strat doubleneck, which could never be mistaken for a real Fender (if there was such a model to compare it to), but looks to be a very nicely made guitar. It's a nice touch having the two output jacks as you probably wouldn't want to put the separate halves of this guitar into the same amp. It does look quite bulky though. I hate to think how much this would weigh and how backbreaking it would be. It's probably one for the Ibanez collectors. I've not got a great deal to say about this Gibson EB650 bass except that I've always liked hollow-bodied basses and think that this rare beastie is quite magnificient. ...found at the Coventry Theatre in 1964 shortly after a gig there by a group called the Tremeloes. The name Welson appears in big letters with the words "Super Jazz" underneath on a plastic plate. The headstock is Stratocaster shaped with a maple with ebony fretboard. It has a "Jazz Tones" slider switch and a separate control knob marked B, M, and T.
There's also a Jazz/Super Jazz slide switch, master Volume and Tone controls and an unusual master On/Off switch. The strings go through a top loading vintage spring whammy system. I can't help wondering if The Tremoloes might want it back. This is a very neat vintage four string Astoria electric guitar that is embossed made in Japan. I cannot find a serial number or model number anywhere. The tighteners at the end are very large compared to others I have seen and this seems rare because it is only four strings versus six. The neck on this guitar is in mint condition and the light maple wood is very modern. The body is in decent shape, though the enamel covering on the black part is scratched up pretty bad. The funky marble looking part is perfect. There is also one area pictured where the enamel is off completely. I don't know if it is enamel covering or a plastic of some sort, but it may be possible to just have that part redone and it would be mint again. 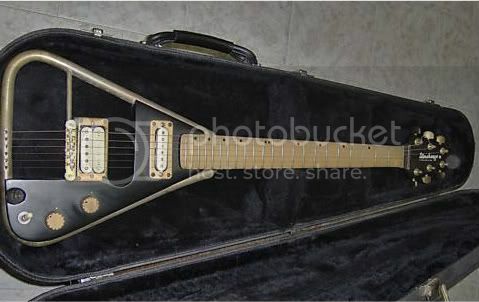 The size and shape of this guitar is interesting too, as it seems much larger and heavier than regular electric guitars. 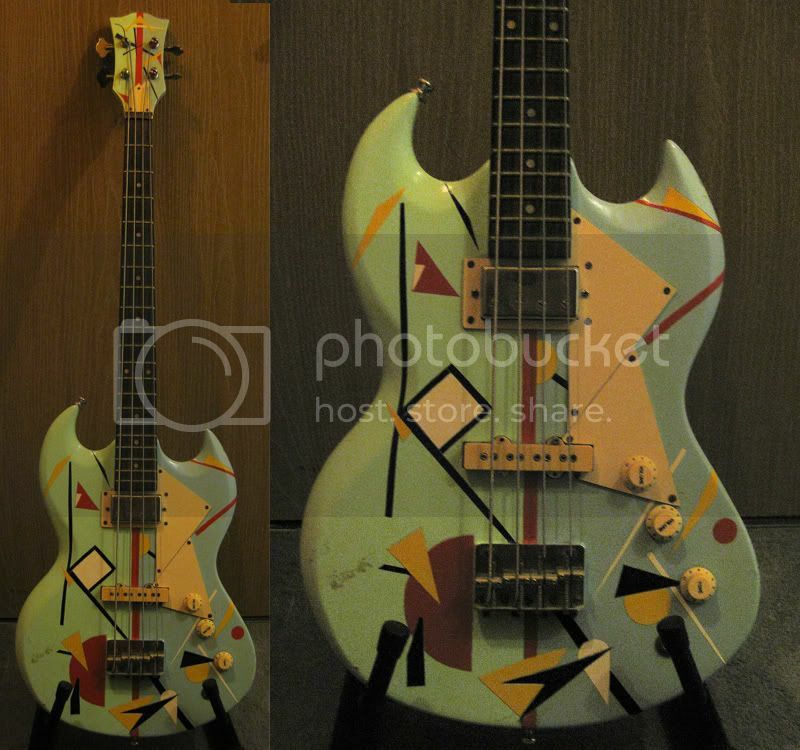 Yes, I know it's very easy to mock who are not interested in the same things as we are and therefore lacking in key knowledge, but if you are selling something like this it might just help your auction if you found out about the existence of bass guitars. 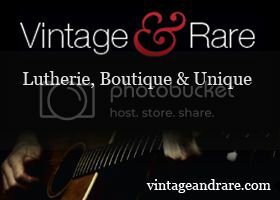 Note also how the words "vintage" and "rare" are bandied about with reckless abandon and without any authority. Banish all thoughts of the Stonehenge scene in Spinal Tap. This guitar has nothing to do with that. 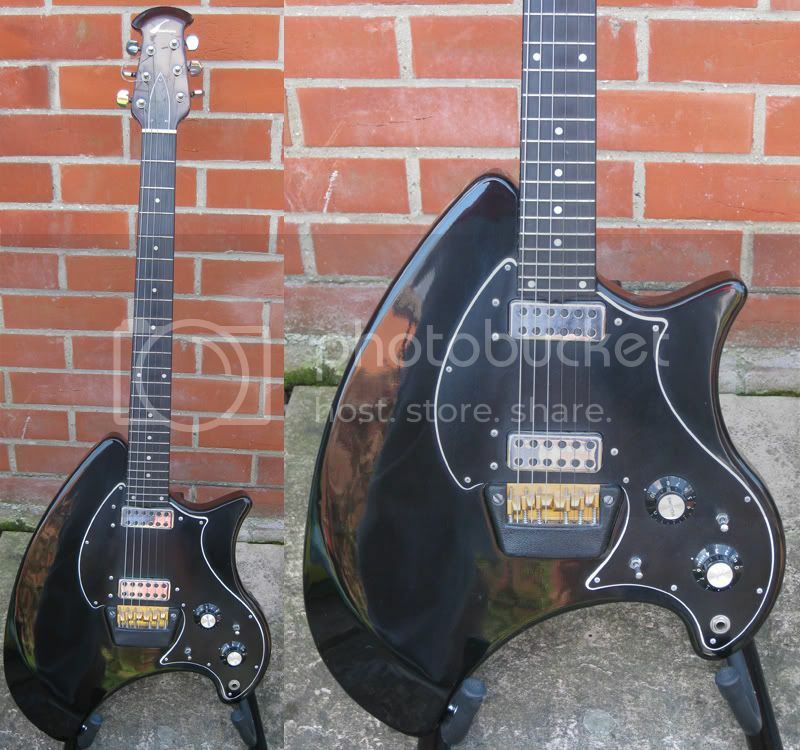 I recall seeing pictures of these Stonehenge guitars back in the 80s when they were first launched - also there's photo of one in Tony Bacon's Ultimate Guitar Book. 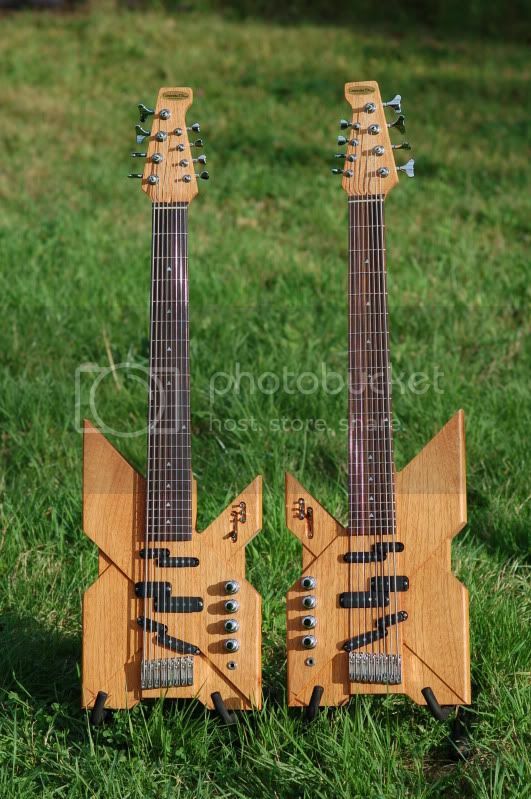 This example is a Stonehenge III by Alfredo Bugari - I hadn't realised they got beyond models I and II as they never really took off or made a big impression to the legions of guitarists worldwide. As you can see in the pic, the body is a simple tubular metal frame with a minimal wooden insert carrying the DiMarzio pickups and electrics. Quite what the advantage is of having a minimalistic body that is mostly air, I do not know. I can't imagine it would be a sustain monster, but am willing to be proved wrong if you know better. 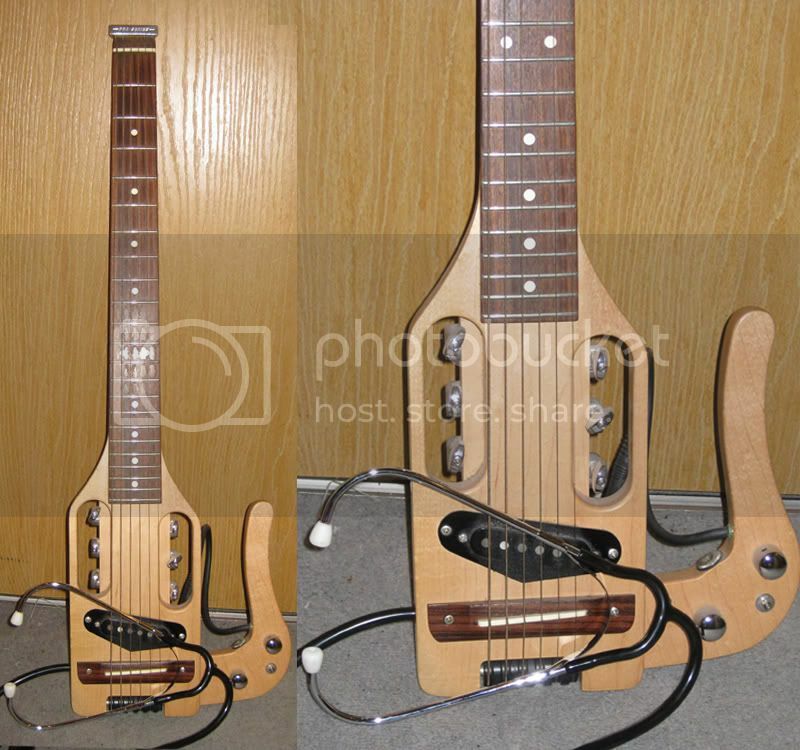 This is another one to add to the list of bonkers guitars from Italy. 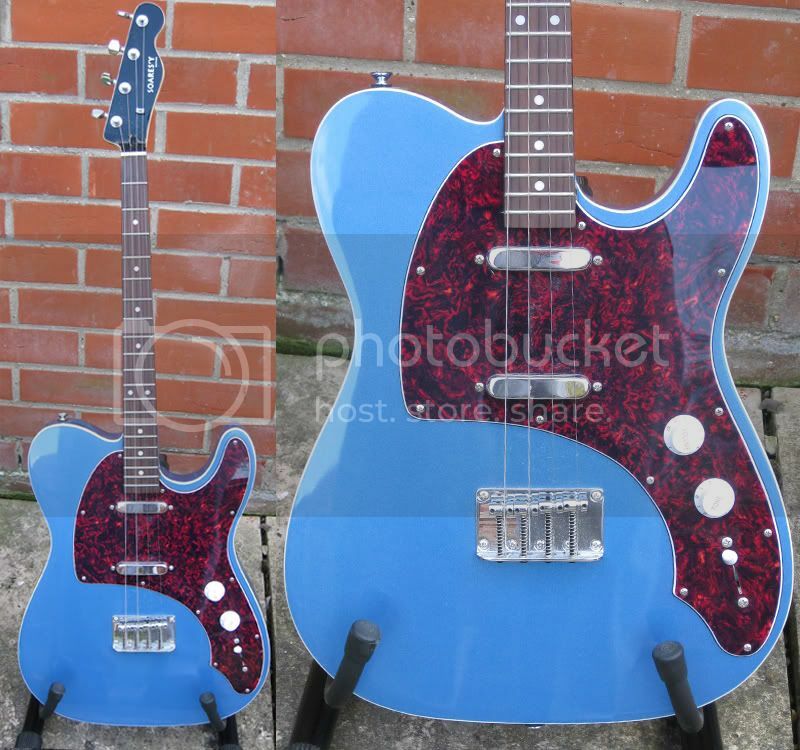 From a very desirable Epiphone to... ermmm... this thing. 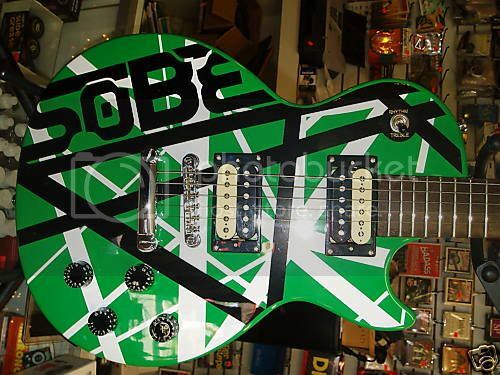 It's an Epiphone SOBE Les Paul, whatever that is. Whatever, the graphics are obviously Van Halen inspired. Does anyone know what "SOBE" is? I tried looking it up on Google but after two pages I was overcome with apathy. Anyway, to sum up in one word: ghastly. I wish I could read what these guys were saying about this blog. 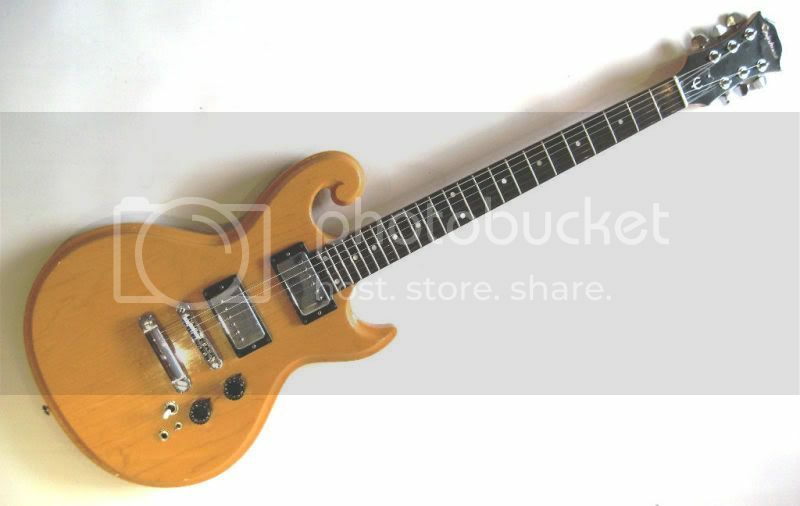 The eBay seller is listing this as an Epiphone Les Paul, but this Epiphone Scroll guitar dates back to the mid 1970s - long before Epiphone were resigned to becoming the Gibson equivalent of Fender's Squier brand. For a 1970s guitar it has a couple of features not often seen on guitars of that era, i.e. a coil tap and a 24-fret neck. Check out some of the reviews on Harmony Central - people seem to really love these guitars, and reportedly - like the Les Paul - they are quite weighty. I'm not 100% on this, but my guess is these guitars were Japanese-built, which is a good thing as Japanese guitars are often excellent and attention to detail is second to none. There was also a bass model - last year I saw a girl band called Ipso Facto supporting Siouxsie Sioux, and the bassist was playing a black Epiphone Scroll - the first time I'd ever seen one in fact. Continuing our theme of cheesy guitars - and we've seen some beauties from Italy, Russia and the former Eastern Germany - I'd now like to present this Jolana Disco Bass which was made in the country formerly known as Czechoslovakia. It dates to the early 1980s and it seems to be styled after Gibson's RD series. 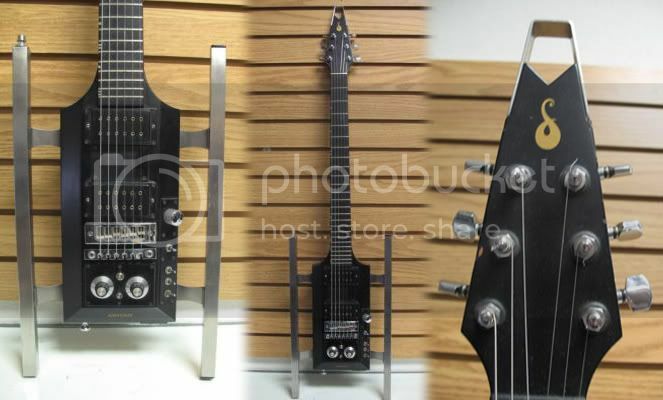 Following the introduction of the revolutionary Steinberger bass in the mid-80s the market was soon flooded with cheap copies and clones of these minimalistic small-bodied headless basses. One of the more unusual was Westone's Rail Bass, as seen here. 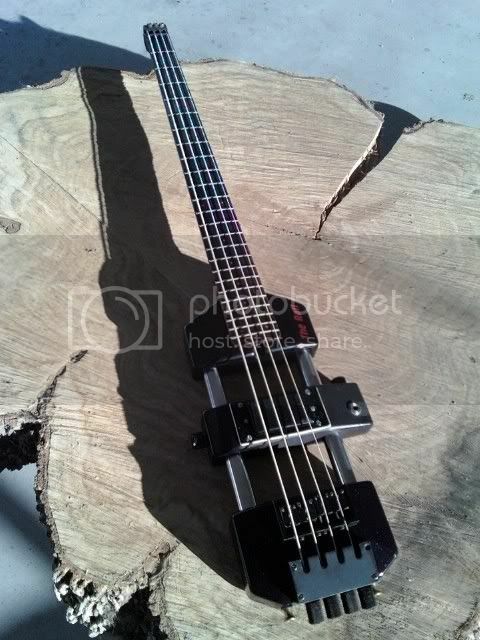 The minimalist body looks especially peculiar as it is divided into two sections connected only by two metal rods - the "rails" in the bass's name - upon which sits a sliding pickup. This is a very cunning way of getting a whole bunch of different tones out of a single pickup. Of course, sliding pickups have been done before - Gibson's Ripper Bass, and Wilkes Guitars "The Answer", but the Westone Rail must be the oddest looking. 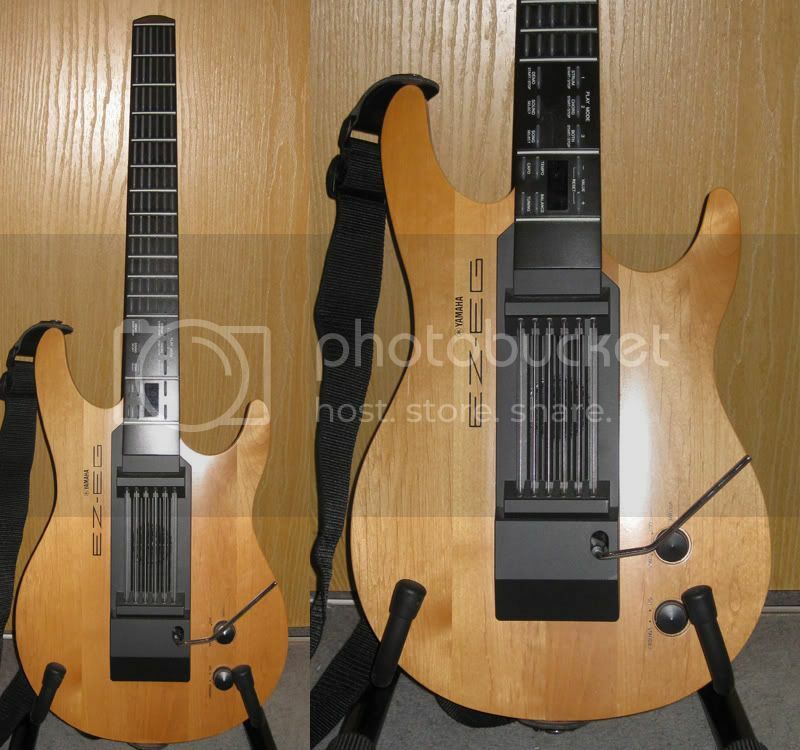 There was also a Rail 6-string guitar, although this may have been a prototype only, I don't think it ever went into production. Bertram from Guitarren has brought this lovely old Musima/Migma semi-acoustic to my attention. I know next to nothing about these guitars. I think it's a Russian instrument, but I'm not sure. (Unfortunately I do not read German so cannot translate the eBay listing). If anyone has any further info, please feel free to pass it on! Additional: it is East German. See the comments. The 8-string Vootar - another interesting instrument from Cassandra Elk Design - is described as being guitar and bass all in one. 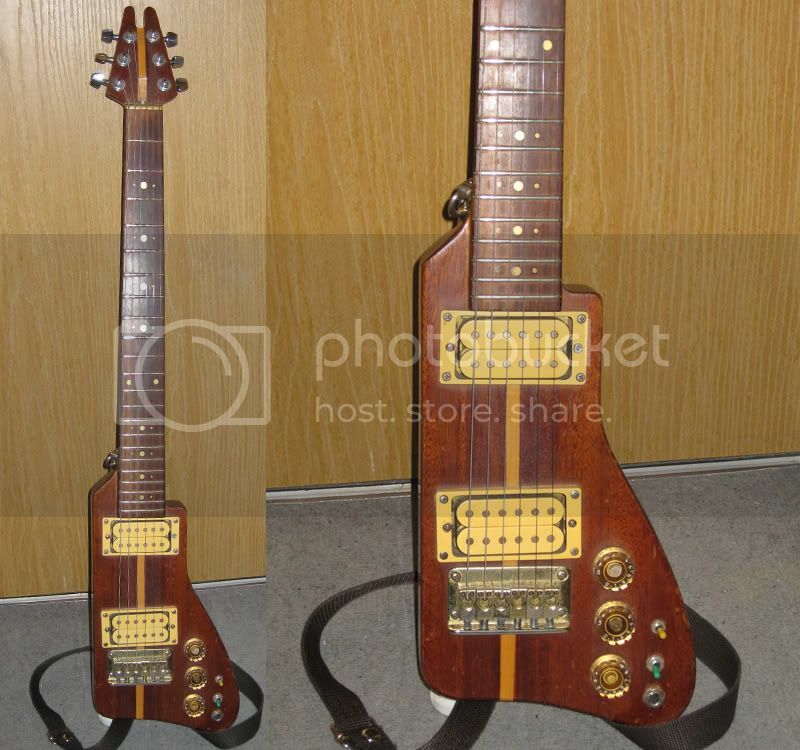 From what I can work out from the German-language description on the eBay selling page, it looks like this instrument was designed by German record producer and musician (and record sleeve designer) Klaus Voorman. I wonder what tuning it uses across its eight strings? 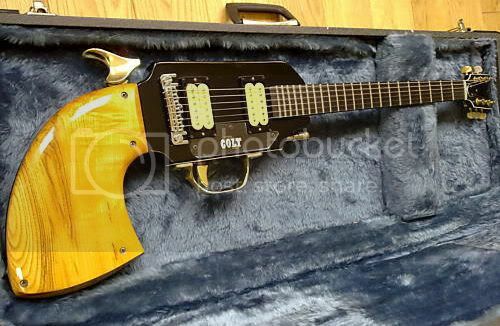 Terrible cliché aside, there's something quite tasteless and almost offensive about guitars shaped like guns. But then I'm speaking as someone who finds guns abhorrent. 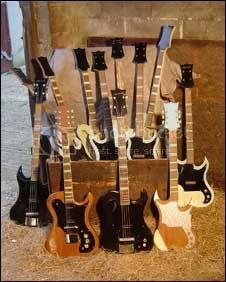 Members of the NRA in America would probably love such guitars. And imbeciles like Ted Nugent. 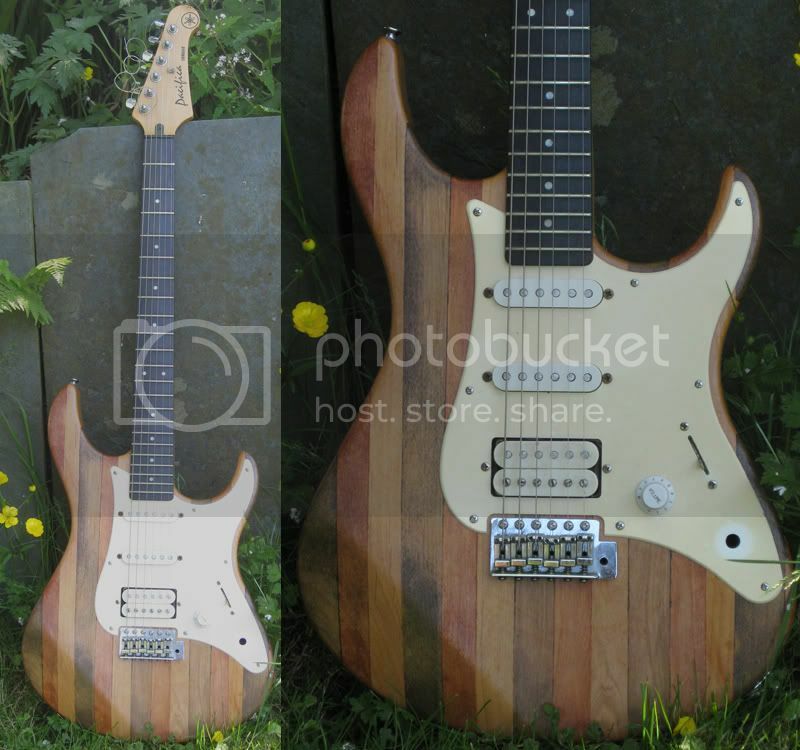 You might expect that this is an American guitar but that is not the case. It was made in England circa 1970 by Jim Cairns (who also made pickups for Burns Guitars). Irrespective of whether you love or hate it, this Colt Peacemaker Mark II, one of the earlier guitars shaped like guns, has some interesting attention-to-detail features. The hammer of the gun is the pickup selector, the trigger is the volume control, and the ejector rod is a push/pull tone control. Apparently Joe Walsh has (had?) one. I'm not sure what that says about him. Four pickups. Push-button pickup selectors. Triple cutaway body design. Yes, it's even more guitar cheese from 1960s Italy. As I write this, this Elli Sound triple cutaway from 1964 has less than 6 hours before the hammer falls on this auction. This 45-year old axe might play like a beauty or it could be a dog. It's so difficult to tell from photos alone and the very briefest of descriptions from the seller. Probably one for the collectors. Update: It didn't sell - reserve not met. The seller would stand a better chance if he described it in greater detail, let people know how it plays and how it sounds. Now you know I just love these cheesy Italian guitars from the 1960s, don't you? Last week we looked at an Eko violin bass and today I am bringing you another bass made by Eko, this time it's the Elite model. 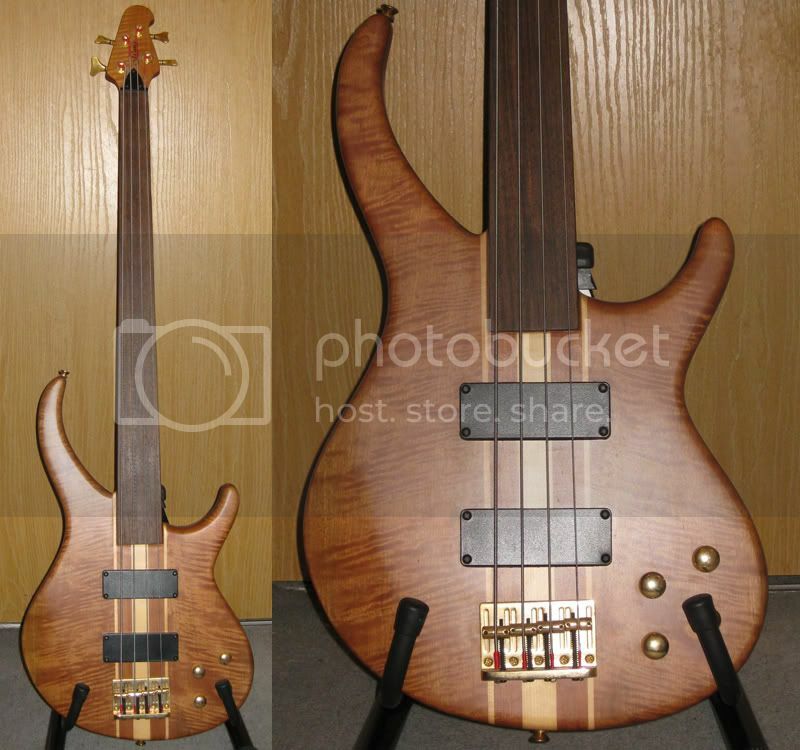 The shape may look familar - every now and again the guitar version crops up on eBay (I've previously featured a Crucianelli-branded Elite 6-string on this blog), but I haven't seen the bass before now. This unusual-looking Sardonyx guitar is not only an ultra-rare beastie, each guitar being custom-made, but also comes from the estate of Amir Bayyan, formerly known as Robert Bell or "Kool" of Kool and the Gang. The only time I remember seeing one of these guitars before it was in the hands of someone quite different - the guitarist of The Plasmatics. 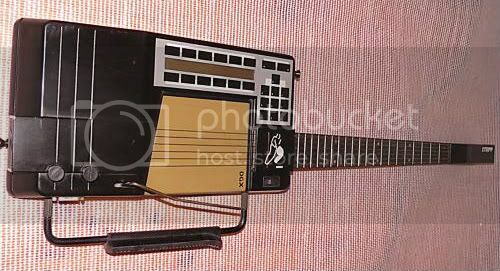 Looking like someone has taken Rolf Harris's Stylophone and stuck a guitar neck on in, the Stepp DGX MIDI guitar controller - whilst still very expensive - was a cheaper alternative to the very wacky-looking Synthaxe. Unlike the Synthaxe, this particular synthesiser controller was much more guitarist friendly in that the strings for the playing and the fretting hands were both on the same plane and pointing in the same direction, and the frets were laid out normally with none of this equal spacing nonsense. It was never a big success, and after appearing in the hands of Maurice Gibb of The Bee Gees and an appearance in the movie Vice Versa (starring Judge Reinhold and Fred Savage as a father and son who swap places) where it was inexplicably overdubbed with the sound of a real electric guitar, it sank without trace. Let's face it, it was no great loss. 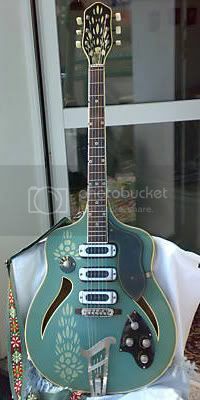 This cheesy-looking 60s-era guitar is a Polish-made Defil Samba, and has a couple of distinct nods to both Hagstrom and Hofner guitars of the same era. It's certainly not one you see every day and looks to be in nice condition, but who can say how well this plays? One for the collector rather than the player, possibly. I rather like this different take on the now familiar violin bass, this example being from Italy's Eko guitars in the 1960s. The black finish on this solid-bodied bass is not original, but makes for a very attractive instrument. With a 30" scale length, it's a short-scale bass, and no doubt it has that particular 60s-era bass sound. Personally I have a soft spot for short-scale basses - I think it may have been a reaction to all that slapping and popping nonsense that happened in the 1980s - it's had a lasting effect on me! Squier Strat Made In USA! And this is my USA Squier! USA Squiers are very rare. Some of them have a serial number with a E = Eighties (1980s) prefix, and some of them have a serial number with a N = Nineties (1990s) prefix. USA Squiers were made for less than a year spanning 1989 and 1990 before production of Squiers went back to Mexico. This was a period when Made in Japan Squiers had stopped and then they moved Squiers to Mexico, but there was a fire in the Mexican factory which disrupted things for a few months in which Fender USA made the Squiers. My Squier was made in 1989 in Corona, California, US. 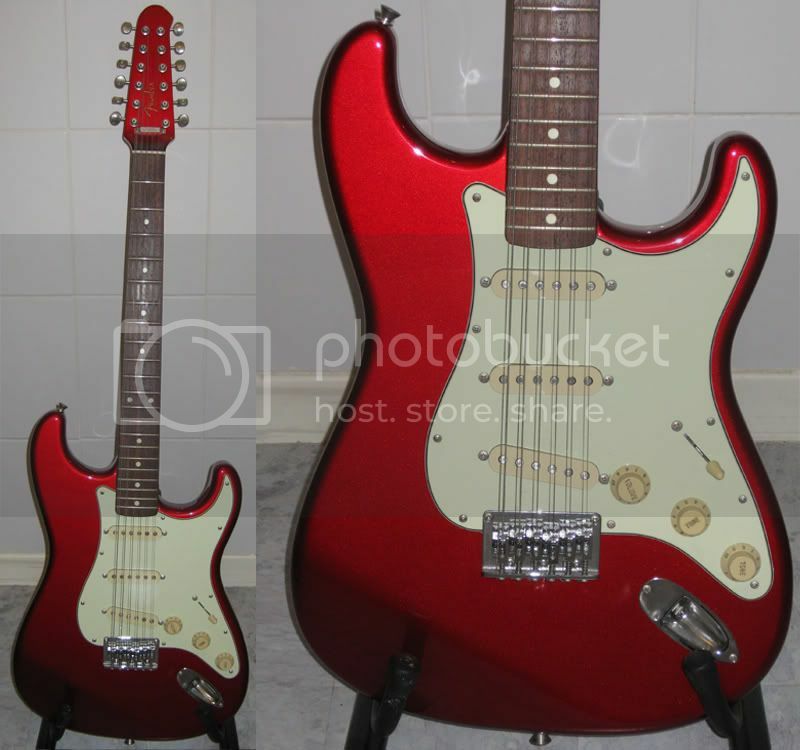 The sound is very good, just like an american Fender guitar from that time & I really love it! 2,500th post! The electric banana! 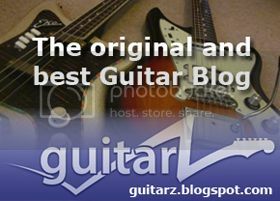 Yes, indeed, this is the 2,500th post on this, the world's longest running guitar blog. I find that quite astounding, especially when you think that I usually only post at a rate of one a day (at least I have done so for the last three or four years). So, to celebrate, I'm showing you this particularly bonkers-looking instrument. 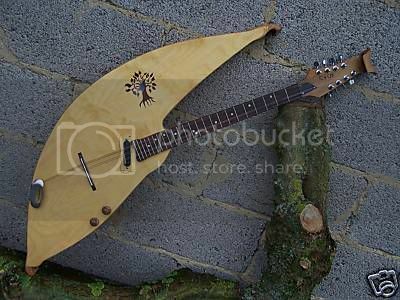 You'll notice that it has eight strings - I think it's some kind of electric mandola or octave mandolin. The burning question, however, has to be: Why the ridiculous banana-shaped body? 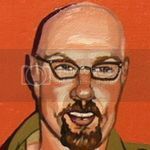 Actually, this eBay seller - Cassandra Elk Design - has quite a few wacko designs on its books, some of which look like they've been knocked up from cheap Strat copies in the garden shed with a jigsaw. I'll probably be re-visiting this "brand" in future posts. 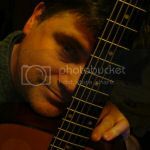 In my post about my own guitars at the start of this month, I listed a Top 20 guitar amongst those that I'd owned and sold on. 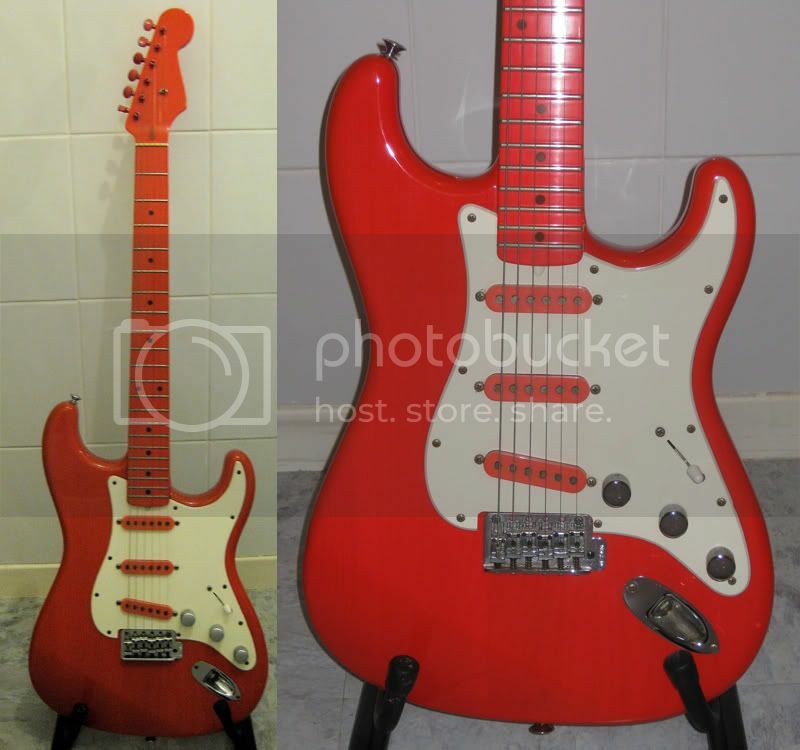 These were the kind of cheap and nasty guitars you could pick up at Woolworths for relatively minimum outlay. But that didn't stop a youthful Wreckless Eric playing one as we see on this clip of him performing his seminal hit, "Whole Wide World". You've gotta give the guy credit for writing such a catchy song with only two chords! 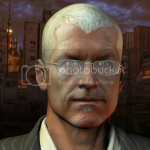 I dedicate this to my friend Phil C, who I only just found out died last month. "This one of my students guitars, he works at the Sparrow Guitars factory. 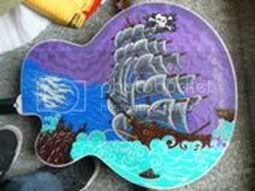 "These pictures are of a Sparrow Guitars of Canada, Big Daddy model. This beautiful axe was painted by Vancouver Artist/painter Bob Scott, and belongs to Skinny Tim McLeod. Tim works at Sparrow and plays with Vicious Cycles and Raised by Wolves. These pics don’t do this paintjob justice; the color is incredibly deep and vibrant. This was a one of a kind work of art. 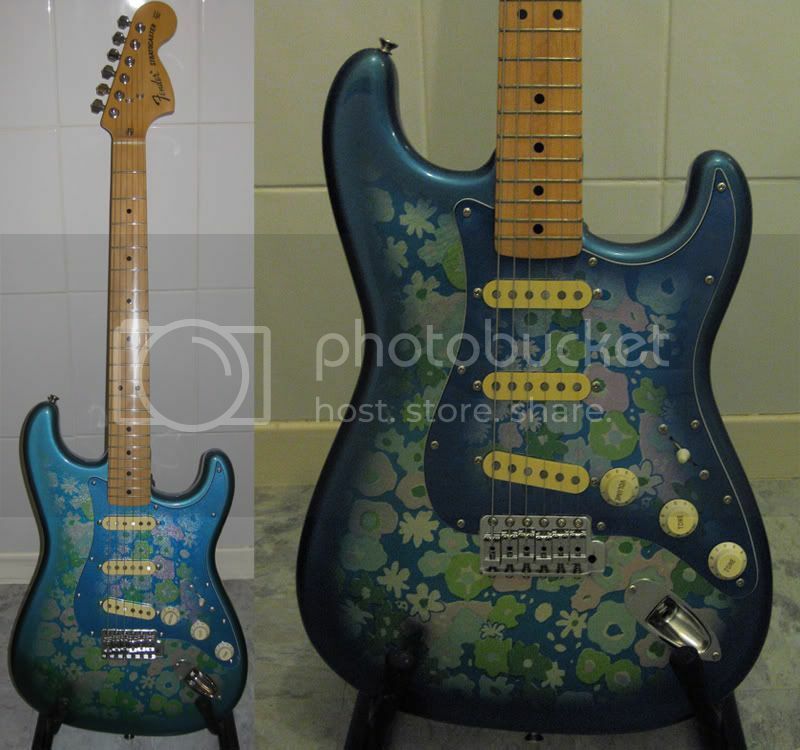 "Check out Sparrow Guitars and Bob Scott's Custom Guitar Painting"
Fender Japan Blue Flower 70s style Strat circa 1988. Bought approx over one year ago - it had one lady owner previously who had played it once then put it away in its case for years, so it's in mint condition. Not to be confused with the more recent inferior re-issues. 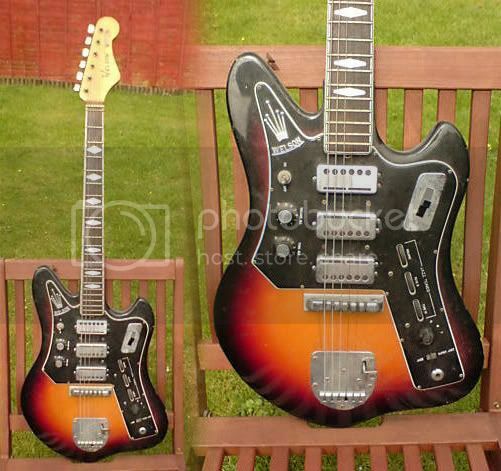 Feline Holy Panther - built by Feline guitars of Croydon using an original 1970s Fender body. Inspired by Russ Ballard's guitar. 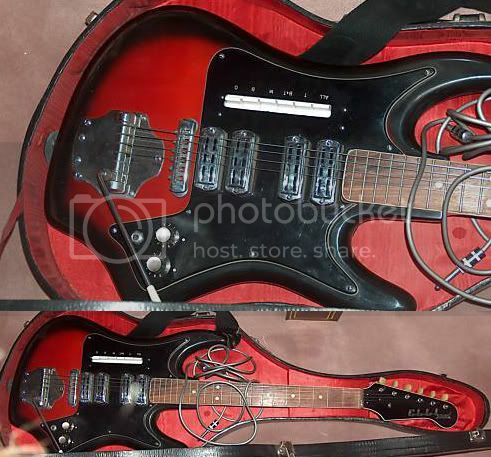 DiMarzio one-off "Red Beauty" built for 1984 NAMM trade show. Read more here. 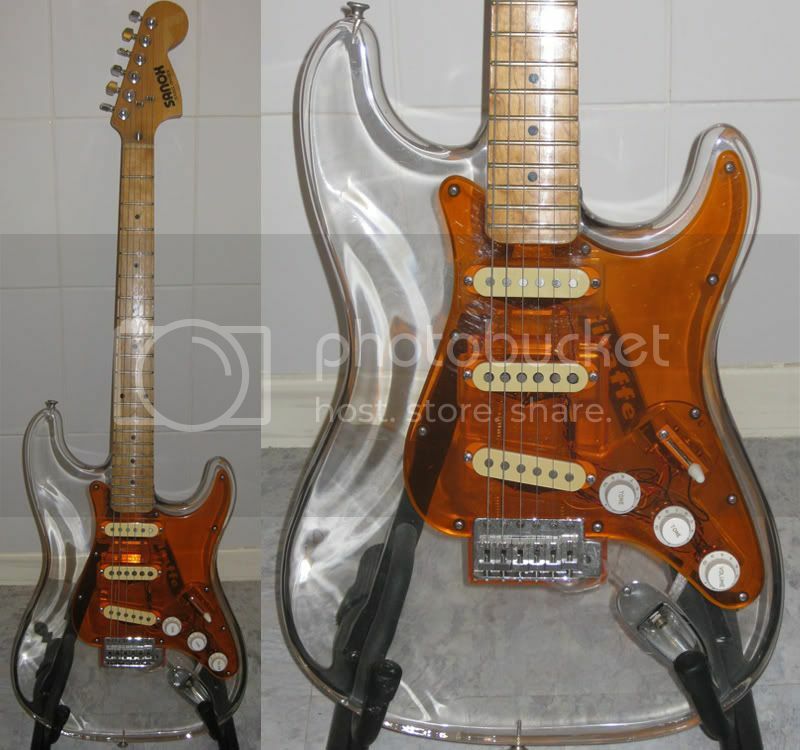 Sanox Sound Creator plexiglass bodied Strat-type guitar. Made in Japan in the 1970s. 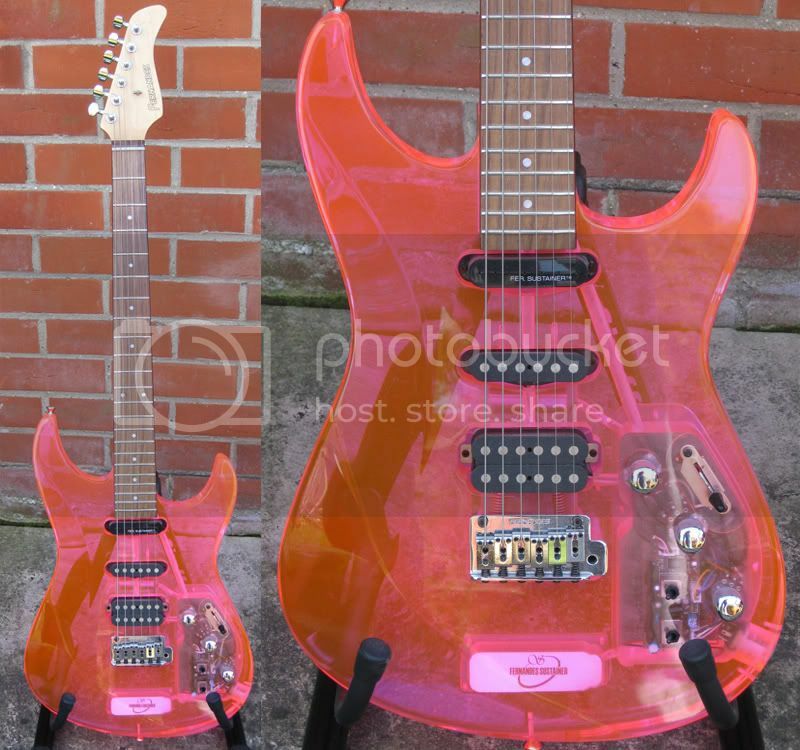 Fernandes Pink Plexiglass Sustainer Guitar. Totally unique. One-off guitar made for the trade shows. VERY heavy. Has far more sustain than other Fernandes guitars I have played. 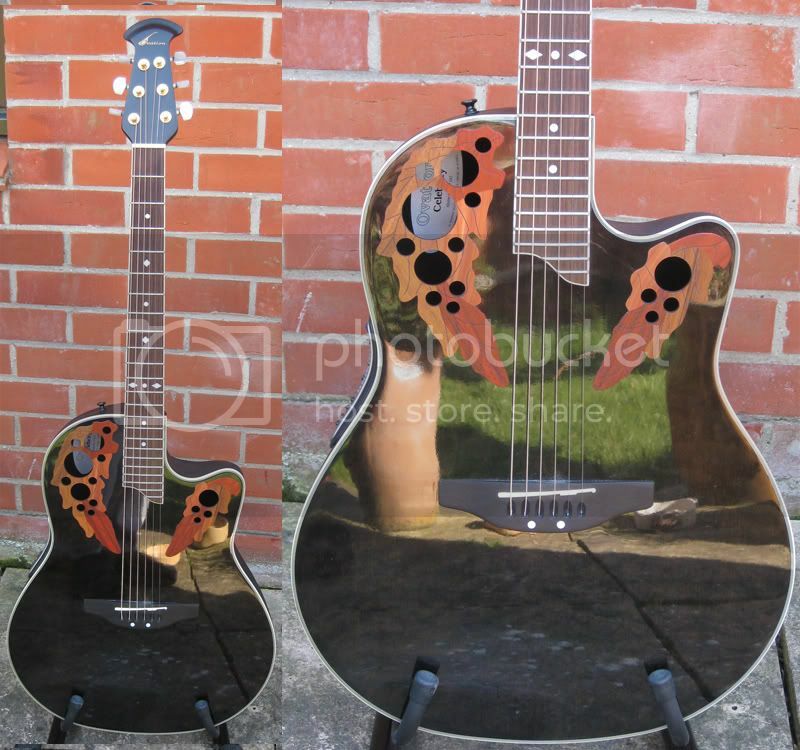 Ovation Celebrity acoustic. I can't remember the model number off the top of my head. Names are always much easier to remember. Nice sound and the built-in tuner is a god-send, but the action's a little high for my tastes. Ovation Breadwinner - circa 1976. A true classic - the first truly ergonomically designed guitar - first production guitar with active electronics and 24-fret neck. Note glossy black finish and small scratchplate. 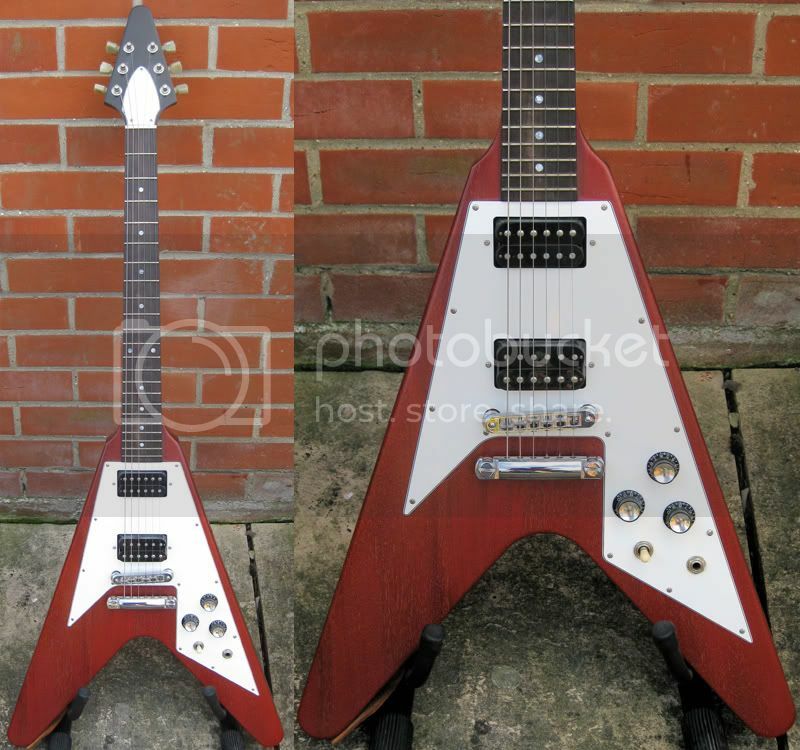 Gibson Flying V Faded Cherry, circa 2004. Short-scale EB0-bass, probably Japanese, early 70s. No, it wasn't me who painted and decorated it. Cheesy-looking but nice sound - particularly from neck pickup. Kay K45 Travel Guitar. Thru-neck construction, DiMarzio designed pickups, brass hardware. Circa 1980s. Traveler Pro Series travel guitar. Features magnetic single-coil pickup, piezo pickup under bridge for acoustic sound, plus "stethophones" which pick up sound from internal diaphram under bridge which lets you privately practice totally acoustically. Made in USA. Yup! It's only got 4 strings. (No - it's NOT a bass). It's a tenor guitar. Very limited edition in Telecaster styling from Soares'y Guitars. 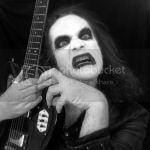 Guitbass. Three-stringed guitar as used by The Presidents of the United States of America. I built this from parts from an old Japanese Strat copy, Epiphone humbucker, plus various other bits and pieces that I had in my box of bits. The three strings are tuned C#, G# and C# (octave higher than the low C#). Looks like sh*t but sounds great. Yamaha EZ-EG. 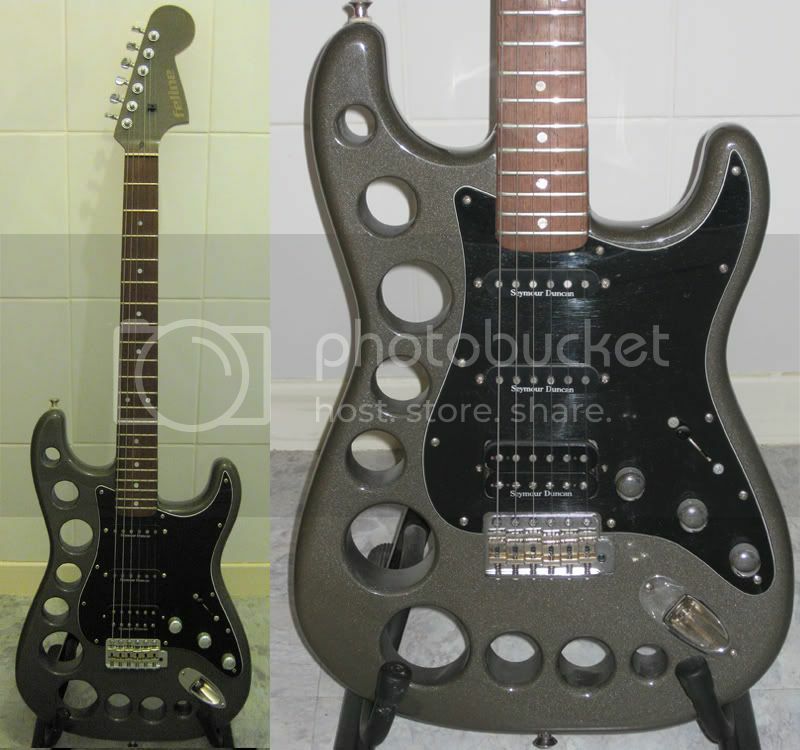 Not really a guitar at all, but a guitar-shaped synth-controller. Has on-board sounds and can connect to other synths via MIDI. The right-hand has picking "strings" and the left hand has buttons laid out for each of the strings at 12 fret positions, so you can indeed play it like a guitar. Countryman 6-string banjo. Banjo players would call it a guitar and guitar players would call it a banjo! 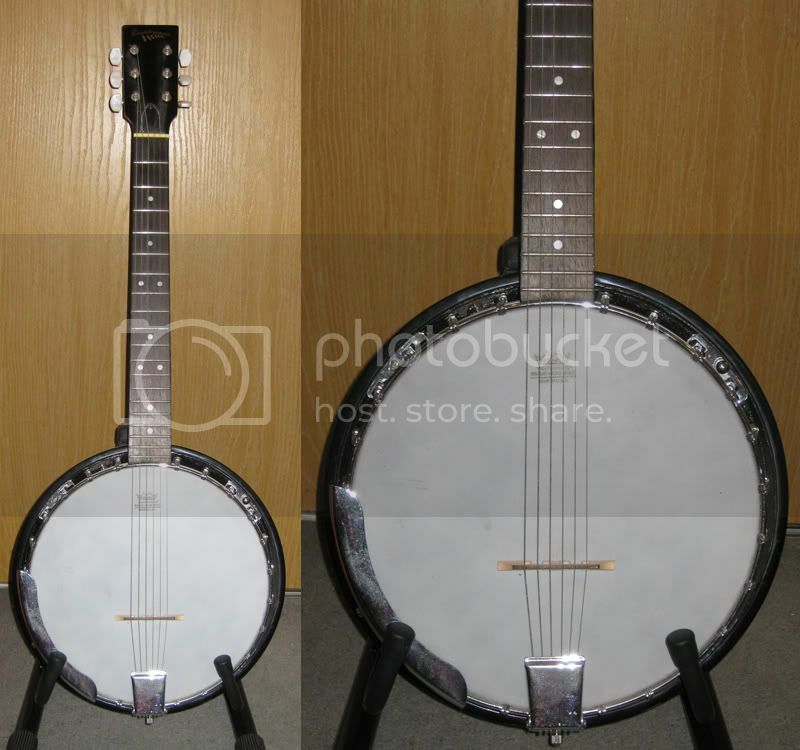 It's a banjo, but with six strings so that a guitarist can use regular guitar tuning and get a banjo sound. Very loud. My ukuleles. 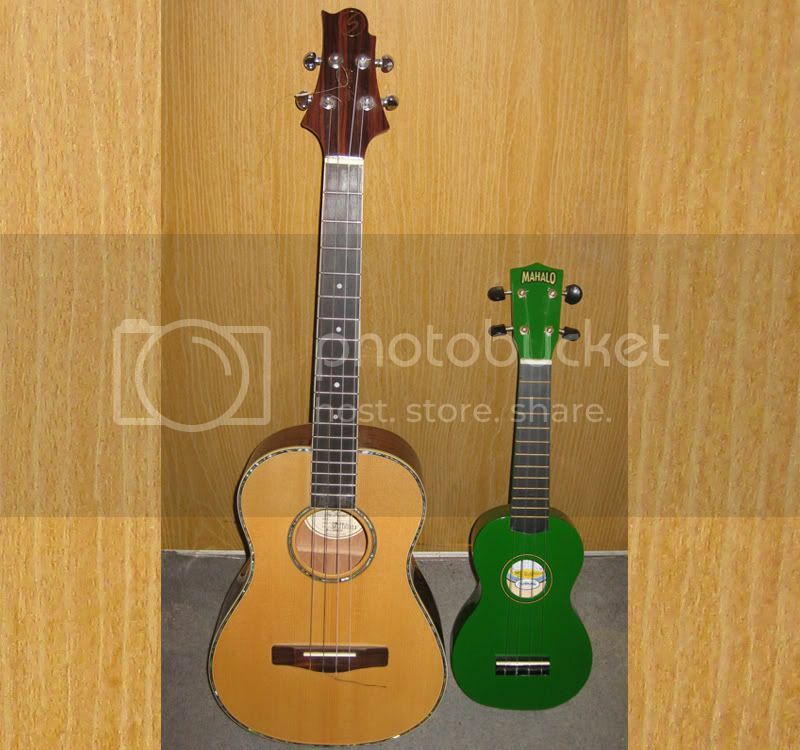 Greg Bennett baritone ukulele on the left and Mahalo soprano on the right. The soprano is a bit small for my large fingers, but I love playing the baritone. ...plus a couple of other cheapies that I didn't keep for very long.